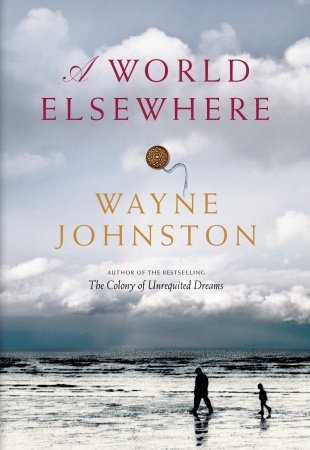 A World Elsewhere by Wayne Johnston. Landish Druken, son a renowned sealing captain, convinces his father to send him to Princeton, with the understanding that he will return to Newfoundland and take his place on his father's ship. While at Princeton he meets astonishingly wealthy Padgett "Van" Vanderluyden and the course of his life changes. Academic dishonesty and Van's betrayal sees Landish expelled from both Princeton and his father's good graces. Back in Newfoundland Landish's father Abram Druken (reminiscent of Abram Kean of the 1914 Newfoundland Sealing Disaster) is held by some to be morally responsible for Francis Carson's death while on a sealing exhibition. Carson's posthumous son, Deacon, is orphaned and adopted by Landish. They find themselves in dire circumstances; the Druken name too feared for Landish to find employment. Landish throws himself on Van's mercy and like Coriolanus seeks out "a world elsewhere". A World Elswhere is gothic and melodramatic. Landish and Deacon find themselves virtual prisoners is Van's mansion - called Vanderland - modeled on Biltmore created by George Washington Vanderbilt in North Carolina. Vanderluyden, due to his extreme wealth and warped mind, is solitary and has no equal. Their early friendship makes Landish a sort of equal and he fulfills Van's need to have a witness to his life. Landish can still be controlled, however, and is powerless because of his love for Deacon. The plot revolves around a murder which may or may not have happened. As the final of many versions of the tragic event is revealed you are still left wondering if it is indeed truthful. I found this novel to be so compelling that I was not bothered by my bus being delayed 45 minutes on the Bedford Highway. Johnston has created in Landish Druken another character which just propels you through the story, much like his Joey Smallwood in The Colony of Unrequited Dreams and, my favourite, Draper Doyle of The Divine Ryans. Again, characteristic of a Johnston novel is playful language and word play. Landish, who was fond of a drink, would sing "what shall we do with a Druken sailor" and Van's daughter Goddie, who seems out of step with the rest of the world, has some of the best lines including, " he sent his son to die on the cruise of fiction." Again it reminds me of The Divine Ryans. Uncle Reg is helping young Draper deal with his father's death calling it psycho-oralysis, meaning the patient has to do all the talking. "But for God's sake, he said, don't tell anyone you're being oralized by your uncle. If you do I'll be arrested." This word play is sprinkled throughout the book and is reminiscent of P.D. Wodehouse, James Joyce and G.K. Chesterton.